We record many events, with photos if possible. These are useful if you want to see what happens in OLLI at Duke, and to see your friends having fun in OLLI at Duke social events. Keep your eye out for similar events here and meet up with fellow OLLI members. ​This page has events from January 2018 onwards. To see earlier events, check out this page. 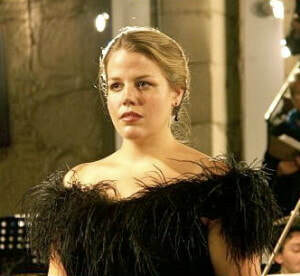 Soprano Andrea Edith Moore, accompanied by pianist Kate Lewis, will perform a recital of Russian opera music. OLLI members who took the Sarah P. Duke Gardens Tour enjoyed the artistry of Mother Nature under blue skies, with comfortable temperatures, and led by knowledgeable tour guides. The transformation of a debris-filled ravine into today’s award-winning Duke Gardens began in the early 1930s through a gift from Sarah Duke that turned a portion of the ravine into an iris garden. When it was flooded by rains, Mary Biddle Duke helped fund turning the ravine into a series of terraced garden in honor of her mother, Sarah P. Duke. Through the efforts of hundreds of volunteers who provided and continue to provide labor and through the generosity of donors, the gardens have expanded into 4 distinct gardens, graced with hundreds of flowers and plants and 5 miles of pathways and allées that lead you on a journey that is a feast for the eyes and a sanctuary for renewing the spirit. You can see a glimpse of portions of the gardens that OLLI members experienced in the accompanying slide show. You can learn more about the gardens here where you can learn what is blooming and find helpful information to plan your visit, albeit a visit with OLLI members has the extra-special touch of connecting with other members. The OLLI at Duke Spanish Conversation Table will convened on Friday, April 20th at 12:45 p.m. at Lucha Tigre. This Dutch treat gathering welcomes Spanish speakers of all levels who wish to practice conversational Spanish. Please RSVP by email to Margaret Riley with Spanish Conversation Table in the subject Line by Wednesday, April 18th if you plan to attend. The Spring OLLI Walk & Learn will took place on Wednesday, April 11, at 11:00 AM at Johnston Mill Nature Preserve, a property in Chapel Hill owned by the Triangle Land Conservancy, who were our hosts for the Brumley Forest walk last month. 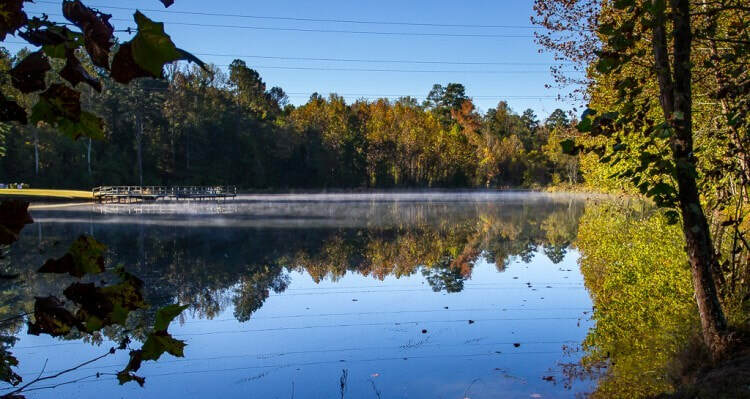 The Johnston Mill Nature Preserve is 296 acres and features many of the same natural attributes you encounter at its bigger, better-known neighbors, Eno River State Park and Duke Forest, but minus the crowds. A two-mile stretch of New Hope Creek meanders through the northeast portion of the preserve. Like the larger Eno, it has rocky sections reminiscent of a mountain creek as well as placid, reflective stretches. Also at Johnston Mill Nature Preserve, you’ll find portions of the Old Field Bluff Trail that pass through an early successional forest only beginning to recover from their recent farmland past. Meanwhile, the Beech Loop Trail begins in a maturing forest of red cedar, black walnut, tulip poplar and sweet gum, then climbs a steep bluff where stout beech trees more than 150 years old stand tall. Walk participants will also see evidence of the Johnston family’s 200-year inhabitance of the land in the faint ruins of two old gristmills along New Hope Creek and in scattered, crumbling stone chimneys and hearths. “I am happy to report that Matt Rutledge, associate manager of stewardship for the TLC, who served as our guide at Brumley Forest, will once again be with us for this walk,” said OLLI volunteer Jeanne Yocum, who organizes the OLLI Walk & Learn events. “Then after an hour at Johnston Mill, those who are interested can travel the short distance to the Root Cellar Café, also in Chapel Hill, for coffee or lunch. 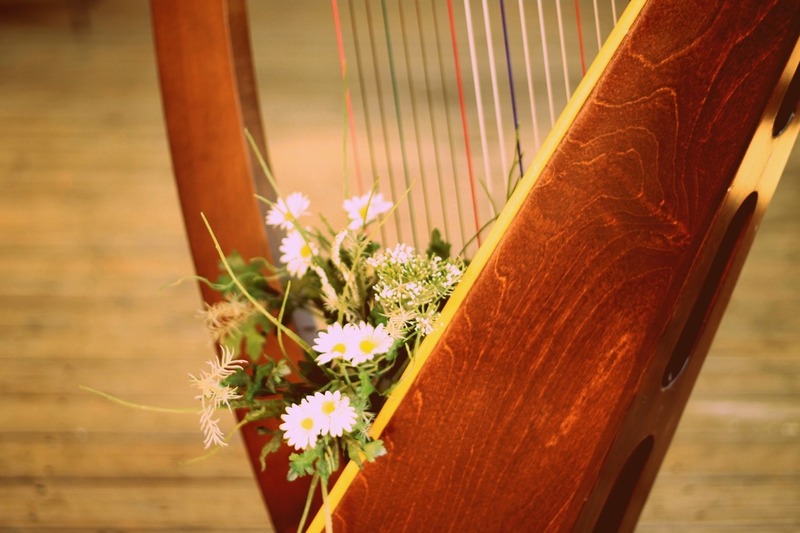 You are cordially invited to a FREE harp concert given by the Harp Ensemble Class of Winifred Garrett. Light refreshments will be served, and registration is not required. ​You can view the Holliday OLLI Harp Ensemble concert presented in 2017 here. Read more about Winifred Garrett. 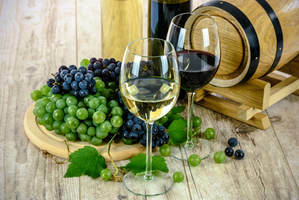 Our wine expert, Mike Smith resumed OLLI at Duke Wine Society events with 5 wines for March Madness tasting; we had three reds & two whites, paired with foods for each. ​View the slides to see all the fun. Join OLLI at Duke for an exciting, docent-led tour of the James B. Hunt Library at NCSU. The Hunt Library is a North Carolina gem and library for the future, integrating architecture, art, technology, and robotics. You will see the large robotic book storage and retrieval system in action. A special tour for OLLI members and guests was held on Monday, March 5th. followed by an optional lunch follows the tour at "On the Oval," a short walk from the library. The tour covered Bookbot, (the robotic book retrieval system), a plethora of technology rich study areas, the Teaching and Visualization Lab, and a hos of other features. If you missed this event, you can tour the library on your own. 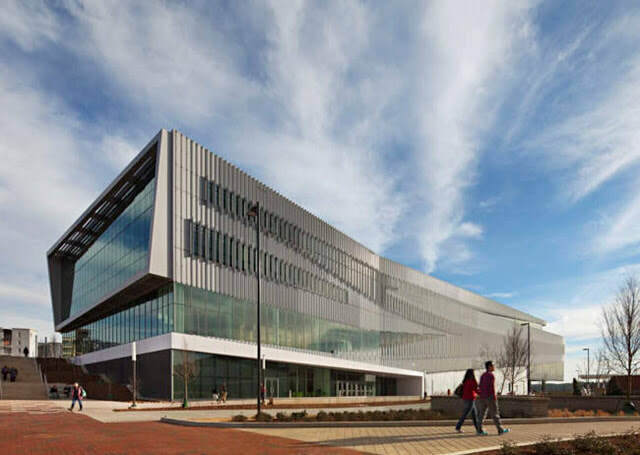 The Hunt Library address is 1070 Partners Way, Raleigh, NC 27606. Hourly parking is available in the Poulton Pay Lot across the street from the library's main entrance. Parking fee $2/hr. Parking spots are numbered and there is a pay station that accepts credit & debit cards only, no cash. This event organized by the OLLI at Duke Membership Committee. Start 2018 off right by joining the next OLLI Walk & Learn event, which will take place on newly opened trails at the north section of Brumley Forest, a Triangle Land Conservancy (TLC) nature preserve in Chapel Hill. This event is set for Thursday, January 4, from 1:00 to 3:00 pm. A guided walk will take approximately one hour and then we’ll warm up with hot drinks at the Root Cellar Café (formerly Foster’s) in Chapel Hill. At 613 acres, Brumley Forest is the second largest private undeveloped parcel in Orange County and is the second largest of TLC’s 10 nature preserves. It is located right across New Hope Church Road from the Edeburn Division of the Duke Forest, which is over 400 acres. Together, these properties have over 1,000 acres of contiguous conserved land. The southern portion of Brumley opened to the public in April 2017, and the northern section opened in early November. According to Matt Rutledge, associate manager of stewardship for the TLC, Brumley’s south trails have eight miles of multi-use trails (which allow mountain biking) and 2.6 miles of hiking-only trails. The northern section, where our walk will take place, is only for hiking and has 3.5 miles of trails. Participation in this OLLI Walk & Learn is limited to 30 people. Please RSVP by Feb. 16, 2018 to olliwalk@olliatduke.org. “Please include the number of people in your car and whether you intend to join us for coffee after,” said Yocum. Your reservation will be confirmed. The address for the Brumley Forest north trails parking lot is 3620 Old State Highway 10, Chapel Hill or 3620 Old NC 10, Chapel Hill, depending upon which version your GPS prefers. Some carpooling may be required from the larger parking lot of the southern trails at Brumley, which is just a little over a mile away at 3055 New Hope Church Road. The pond in fall at The George and Julia Brumley Family Nature Preserve. Photo by Sam Upchurch, 2015. 4907 Garrett Rd Durham, North Carolina 27707 . ​The performances by Anecdote and Heart of Carolina A Capella featuring GQ. The time slots will remain the same: 3pm for the matinee and 7pm for the evening show. ​Tickets are now on sale at the chapter’s www.hcamusic.org website or at the door of the event. dvanced sale for Matinee tickets is $15, for Evening tickets - $20. Day of show sales are $5 more. Your tickets purchased for the original Dec. 9 shows will be honored. If needed, you can get a refund by contacting info@hcamusic.org. Raleigh-Durham's largest group of poets, Living Poetry, turns 9! Come celebrate Living Poetry's anniversary with a relaxing afternoon over good food and drinks on January 20, 2018 from 2:00 PM to 4:00 PM at the Breakaway Cafe. We will hold our first-ever Secret Swap Poetry on Demand, plus Poetry Book Swap. Bring a word, then exchange your word with another Living Poet. You'll have 3 minutes to write a poem inspired by the word. Meet other members and share memories from past events. For the Poetry Book Swap, bring a copy of your book (if you've written one) or a favorite poetry book to swap. Grab a raffle ticket when you arrive to learn when you'll get to pick from the poetry book swap selection. 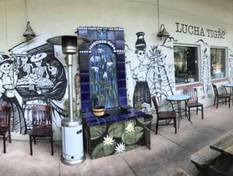 The OLLI at Duke Spanish Conversation Table will reconvene on Friday, January 19th at 12:45 p.m. at Lucha Tigre Restaurant, 746 Martin Luther King Jr Blvd, Chapel Hill, NC. This Dutch treat gathering welcomes Spanish speakers of all levels who wish to practice conversational Spanish. Please RSVP by email to Margaret Riley with Spanish Conversation Table in the subject Line by Wednesday, January 17th if you plan to attend. New to OLLI? Let's Get Together! You are invited to join us for a morning program hosted by our Membership Committee. New OLLI at Duke members will have an opportunity to meet other members and supporters, board of advisor members, and our director, Garry Crites. We’ll have refreshments, and after the program (around 12:30pm), we will tour nearby Lilly Library and the Marketplace dining hall on Duke’s East Campus. If you are planning to attend, please respond by e-mail to OLLIatDuke@aol.com, with the subject “Meet & Greet.” We look forward to seeing you on January 6.